I love cliff diving because it is limitless. The obstacles you face are your own boundaries and breaking those is what fuels the passion to go higher, fly longer, and reach the safety of the water for that incomparable rush of success. I am a 23 year old Gemini, fresh off the boat of college graduating from the University of Hawaii at Manoa. I studied Religion, Anthropology, Islamic Studies and Peace and Conflict Studies. My passion for traveling and culture has taken me to 13 different countries on 5 different continents. My hope is that cliff diving can fuel my adventures and allow me to continue traveling to the ends of the earth. Born in small town Steamboat Springs, Colorado, I grew up learning the value of family, the support of true friends, and the comfort of good neighbors that big cities just can't provide. However, as any isolated bird would do, I took the first chance I could to fly across the ocean and attend school on the island oasis of Honolulu. My spark for cliff diving was born amongst the crashing waves and smooth rocky cliffs of East shore, Oahu. Five years of college diving with two of the best coaches in the sport, allowed me to grow and thrive in ways I never thought possible. Not to mention the beautiful team I call family and the islands I now call home. But home is where the heart is and I have my eyes set on the horizon in search of adventure. In 2013 I studied abroad in Sevilla, Spain where I fell in love with traveling and the diversity it offers. I live to explore new places, try different food, and learn about other cultures. My passions of cliff diving and traveling seems to be molding together perfectly as I will soon be attending my first cliff diving competition in Switzerland at the end of July. Coming from being the lone diver on my high school team, which only had a 1-meter springboard, to being the 10 meter platform champion at the MPSF conference championships this year reminds me that the only limit to how far I can go in diving is my own strength and courage. 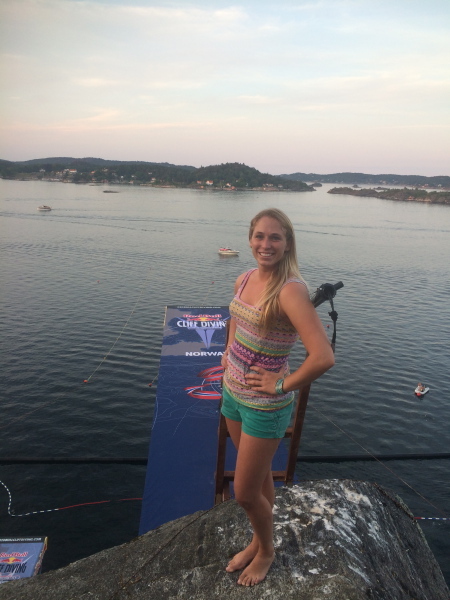 My goal is to be the best cliff diver I can be while enjoying the adventures this mission will undoubtedly create.